Wilbur and Orville Wright were the sons of Milton Wright, a bishop of the United Brethren in Christ. Wilbur was born on April 16, 1867, in Millville, Indiana. Orville was born on August 19, 1871, in Dayton, Ohio. Until the death of Wilbur in 1912, the two were inseparable. Their personalities were perfectly complementary (each provided what the other lacked). Orville was full of ideas and enthusiasms. Wilbur was more steady in his habits, more mature in his judgments, and more likely to see a project through. While in high school, Wilbur intended to go to Yale and study to be a clergyman. However, he suffered a facial injury while playing hockey, which prevented him from continuing his education. For the next three years he continued his education informally through reading in his father's large library. In their early years the two boys helped their father, who edited a journal called the Religious Telescope. Later, they began a paper of their own, West Side News. They went into business together as printers producing everything from religious handouts to commercial fliers. In 1892 they opened the Wright Cycle Shop in Dayton. This was the perfect occupation for the Wright brothers because it involved one of the exciting mechanical devices of the time: the bicycle. When the brothers took up the problems of flight, they had a solid grounding in practical mechanics (knowledge of how to build machines). The exploits of one of the great glider pilots of the late nineteenth century, Otto Lilienthal, had attracted the attention of the Wright brothers as early as 1891, but it was not until the death of this famous aeronautical (having to do with the study of flying and the design of flying machines) engineer in 1896 that the two became interested in gliding experiments. They then decided to educate themselves in the theory and state of the art of flying. 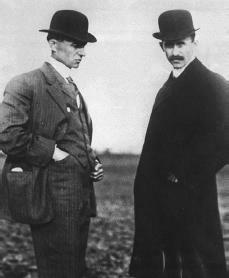 Wilbur Wright (left) and his brother Orville. The Wrights took up the problem of flight at a favorable time, for some of the fundamental, or basic, theories of aerodynamics were already known; a body of experimental data existed; and, most importantly, the recent development of the internal combustion engine made available a sufficient source of power for manned flight. The Wright brothers began by accumulating and mastering all the important information on the subject, designed and tested their own models and gliders, built their own engine, and, when the experimental data they had inherited appeared to be inadequate or wrong, they conducted new and more thorough experiments. The Wrights decided that earlier attempts at flight were not successful because the plans for early airplanes required pilots to shift their bodies to control the plane. The brothers decided that it would be better to control a plane by moving its wings. The Wright brothers proceeded to fly double-winged kites and gliders in order to gain experience and to test the data they had. After consulting the U.S. Weather Bureau, they chose an area of sand dunes near the small town of Kitty Hawk, North Carolina, as the site of their experiments. In September 1900 they set up camp there. The Wrights's first device failed to fly as a kite because it was unable to develop sufficient lift (upward force). Instead, they flew it as a free glider. They kept careful records of their failures as well as of their successes. Their own data showed conclusively that previous tables of information they had were greatly inaccurate. Returning to Dayton in 1901, the Wright brothers built a wind tunnel (a tunnel wherein one can control the flow of wind in order to determine its effect on an object)—the first in the United States. This is where they tested over two hundred models of wing surfaces in order to measure lift and drag (resistance) factors and to discover the most suitable design. They also discovered that although screw propellers had been used on ships for more than half a century, there was no reliable body of data on the subject and no theory that would allow them to design the proper propellers for their airship. They had to work the problem out for themselves mathematically. The Wrights, by this time, not only had mastered the existing body of aeronautical science but also had added to it. They now built their third glider, incorporating their findings, and in the fall of 1902 they returned to Kitty Hawk. They made over one thousand gliding flights and were able to confirm their previous data and to demonstrate their ability to control motions of the glider. Having learned to build and to control an adequate air frame, they now determined to apply power to their machine. The Wright brothers soon discovered, however, that no manufacturer would undertake to build an engine that would meet their specifications, so they had to build their own. They produced one that had four cylinders and developed 12 horsepower (a unit that describes the strength of an engine). When it was installed in the air frame, the entire machine weighed just 750 pounds and proved to be capable of traveling 31 miles per hour. They took this new airplane to Kitty Hawk in the fall of 1903 and on December 17 made the world's first manned, powered flight in a heavier-than-air craft. The first flight was made by Orville and lasted only 12 seconds, during which the airplane flew 120 feet. That same day, however, on its fourth flight, with Wilbur at the controls, the plane stayed in the air for 59 seconds and traveled 852 feet. Then a gust of wind severely damaged the craft. The brothers returned to Dayton convinced of their success and determined to build another machine. In 1905 they abandoned their other activities and concentrated on the development of aviation. On May 22, 1906, they received a patent for their flying machine. The brothers looked to the federal government for encouragement in their venture, and gradually interest was aroused in Washington, D.C. In 1907 the government asked for bids for an airplane that would meet certain requirements. Twenty-two bids were received, three were accepted, but only the Wright brothers finished their contract. The brothers continued their experiments at Kitty Hawk, and in September 1908, while Wilbur was in France attempting to interest foreign backers in their machine, Orville successfully demonstrated their contract airplane. It was accepted by the government. The event was marred by a crash a week later in which Orville was injured and a passenger was killed. Wilbur's trip to France proved to be a success. In 1909 the Wright brothers formed the American Wright Company, with Wilbur taking the lead in setting up and directing the business. His death in Dayton on May 30, 1912, left Orville feeling depressed and alone. In 1915 he sold his rights to the firm and gave up his interest in manufacturing in order to turn to experimental work. He had little taste for the busy activity of commercial life. After his retirement, Orville lived quietly in Dayton, conducting experiments on mechanical problems of interest to him, none of which proved to be of major importance. His chief public activity was service on the National Advisory Committee for Aeronautics (the government agency that came before the National Aeronautics and Space Administration, or NASA), of which he was a member from its organization by President Woodrow Wilson in 1915 until his death in Dayton on January 30, 1948. The Wright Brothers helped found modern aviation through their curiosity, their inventiveness, and their unwillingness to give up their vision. Culick, Fred E. C., and Spencer Dunmore. On Great White Wings: The Wright Brothers and the Race for Flight. Shrewsbury, England: Airlife, 2001. Howard, Fred. Wilbur and Orville: A Biography of the Wright Brothers. New York: Knopf, 1987. Kelly, Fred C. The Wright Brothers: A Biography Authorized by Orville Wright. New York: Farrar, Straus, and Young, 1951. Reprint, New York: Dover Publications, 1989. This is alot of help with my school report. Thanks! This was extremely useful for a report I have due soon! Thanks a ton! I'm hopin g I get a good grade for my report I ddi on the Wright Brothers, and I love the Wright brothers...they are pretty awesome!! This helped me out so much with my report. Thanks! awesome this helped me so much with my report due friday. i hope i get a good mark! I hope it helps other people too. Thanks to the people who worked on this so we could learn! Maybe I could get a little more info on when they died? Although, everything else was good.